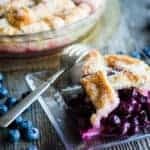 Blueberry Pie, made with a mountain of fresh flavorful blueberries and the absolute best butter pie crust you'll ever taste, is a classic dessert! You will be making two whole 9-inch pie crusts, one at a time. Make sure all of your ingredients are chilled for the best results. Combine 1 cup flour with 1/2 cup (1 cube) and 1/2 teaspoon kosher salt using a pastry blender. Cut through the butter until you end up with pieces about the size of a pea, or smaller. Adding one tablespoon at a time of each, add vodka and water. Use your hands to toss the pastry dough. Continue adding more liquid just until the mixture can hold its shape when pressed together. Shape into a disk, wrap tightly in plastic wrap, and refrigerate for at least an hour. Repeat with second pie crust so that you have two. Combine all of the filling ingredients in a large bowl. Use a masher to gently mash the mixture to break open only a few of the blueberries. You want most of them whole, but a few of the broken ones will really release their juice. Roll out the first pie crust on a floured surface and transfer to a 9-inch pie dish. 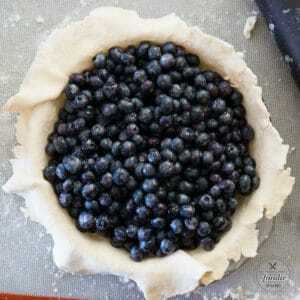 Add blueberry filling. Roll out second pie crust and cut into 1-inch thick strips. Add alternating strips to the top of the pie leaving a 1-inch gap in between strips. 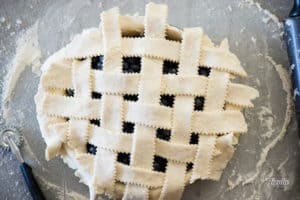 Rotate the pie 90 degrees, and weave remaining strips in an alternating pattern to create a basket weave. Cut any excess crust away and crimp edges together. Cover top of pie with egg wash, discarding any excess egg that doesn't cover surface of pie. Sprinkle decorator's sugar on top of the egg wash while it is still wet. Preheat oven to 400 degrees F. Cover the edge of the crust with a pie ring or foil to keep it from overly browning. You may want to place a baking sheet on the bottom rack to catch any butter that drips. Bake in preheated oven for 15 minutes. Without opening the oven, reduce cooking temperature to 350 degrees F and continue cooking for an additional 40 minutes or until the crust is a golden brown. Be sure to remove pie ring or foil during the last 10 minutes of cooking time. 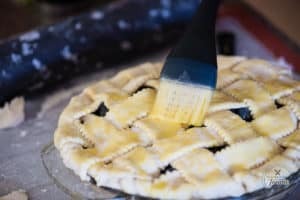 Allow pie to fully cool before slicing. There will be a lot of juice in the pie pan (which is how I prefer it). SEE NOTE. There will be a lot of juice in the pie dish after cooking. If you prefer a thicker filling, you may replace the lemon juice with lemon zest, avoid crushing the berries, and increase the amount of tapioca flour to 1/2 cup. Serving size is based on 1 slice if the pie is sliced into 12 slices.